Beef production requires 28 times more land and 11 times more irrigation water than other livestock. This makes beef 10 times more damaging to the environment, reports BBC. Citing new research published by the Proceedings of the National Academy of Sciences (PNAS), the report says that cattle release five times more greenhouse gases and consume six times more nitrogen than poultry. The research authors claim their paper is the first study to quantify the scale in a comparative way. The researchers divided livestock into five categories—beef, pork, poultry, dairy and eggs. They developed a uniform methodology to measure the comparative impact in terms of land and water use, reactive nitrogen discharge and greenhouse gas emissions. The scientists used data from 2000-2010 from the US department of agriculture to calculate the amount of resources required for all the feed consumed by edible livestock. Beef emerged as the animal with the biggest environmental impact. The overall environmental footprint of beef is particularly large because it combines a low-production efficiency with very high volume, Mark Sutton, one of the researchers, told BBC. Lead author of the study, Gidon Eshel, believes eliminating beef and replacing it with relatively efficient animal-based alternatives such as eggs can achieve an environmental improvement comparable to switching to plant food source. Researchers say the conclusions of the study are applicable in Europe, although the work is based on US data. “Over 60 per cent of the environmental burden of livestock in the US results from beef. Although the exact numbers will be different for Europe, the overall message is similar: cattle dominate the livestock footprint of both Europe and US,” says Sutton. The PNAS study says livestock production impacts air and water quality, ocean health and greenhouse gas emissions on regional to global scales and sees the quantification of environmental impacts of various livestock categories as a big challenge of sustainability science. Another research published in the journal Climatic Change finds that livestock emissions are on the rise. The researchers, including Dario Caro, formerly with the Carnegie Institution for Science, and Carnegie’s Ken Caldeira, estimated greenhouse gas emissions related to livestock in 237 countries during 1961-2010. They found that methane and nitrous oxide emissions from livestock in 2010 contributed to 9 per cent of all greenhouse gases. They say these emissions increased by 51 per cent over the analysed period. However, Caro and Caldeira found a stark difference between livestock-related emissions in the developing world, which accounts for most of the increase, and that released by developed countries. In contrast, developed countries reached maximum livestock emissions in the 1970s and have been in decline since. “The developing world is getting better at reducing greenhouse emissions caused by each animal, but this improvement is not keeping up with the increasing demand for meat. 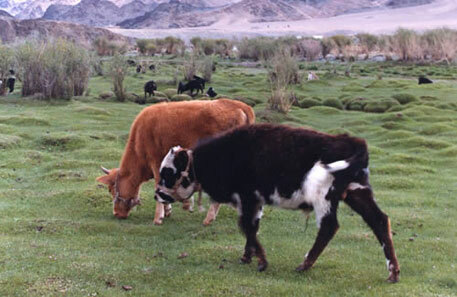 As a result, greenhouse gas emissions from livestock keep going up in much of the developing world,” Caro said. The research echoes the PNAS study in citing beef as the biggest contributor to greenhouse gas emissions. According to its data, beef and dairy cattle comprise 74 per cent of livestock-related greenhouse gas emissions, with 54 per cent coming from beef cattle alone. Part of this is due to the abundance of cows, but mostly because cattle emit greater quantities of methane and nitrous oxide than other animals.